About New Leaf – A new leaf in landscape maintenance and design. New Leaf is a professional landscape design and maintenance company committed to meeting and exceeding our customer’s expectations. Great communication is the foundation of New Leaf’s quality service. Communication starts with listening to our customer’s needs and expectations and then responding to their requests. We then regularly contact our customers to make sure that we are meeting their needs. Following these basic principles is enabling New Leaf to become one of the largest providers of quality landscape design and maintenance in the Idaho Falls area and beyond. New Leaf is passionate about quality and our crews are too. When on the job, we become the eyes and ears of our customers, identifying potential site issues and presenting solutions that meet their needs and budgets. We care for your property not only in the short term but also in the long term by using sustainable practices that will ensure your landscape will look great for years to come. New Leaf customers have been so pleased with our commitment to quality and service that they continually reward us with their loyalty and countless referrals. We are in the business of giving peace of mind when it comes to maintaining landscapes. Property owners have invested a lot of time and money in their landscapes and they want to protect their investment. They need someone to hand the reigns over to and let them care for it in such a way that the person feels at ease and confident that their landscape is in good hands. New Leaf is founded on the belief that people need a landscape company they can trust to care for their property not only in the short term but later as well. With our experience and education we know and use practices that are sustainable, ensuring a great look for years to come. Our clients don’t worry; they let us take care of it. With this in mind we have developed a corporate culture based on being Honest, Reliable, Knowledgeable, and Attentive. The atmosphere we created based on these principles attracts team members who share these values as well providing a wonderful experience for our customers. For all of us at New Leaf, these four core values act as a compass, directing us in our decisions and performance and promoting customer satisfaction. An honest and trustworthy company needs to exhibit several qualities: they need to be trusted to make landscapes look great, they need to be honest with the client in limiting recommended services to only those that are necessary, they need to work at a fair price, and live up to their contracts. No one likes to spend money unnecessarily. When people switch to us, we have saved money for some by removing a service from their plan that wasn’t needed. Because of this, when we recommend a service people know that we are trying to give them the best looking landscape possible. We provide quality work and live up to our contracts. At New Leaf we don’t promise anything we can’t deliver. To us, reliable means being capable and consistent, allowing the customer to count on us. We follow regimented procedures to run our company, so we are there when we say we will be. Our system consistently provides the same results of satisfied customers. Relying on us allows people to be free of the worry of taking care of their properties. We create and keep lawns and landscapes thriving. Some people believe anyone with a truck and lawn mower can have a landscape maintenance business. But knowledge is necessary too. We have staff with degrees in horticulture and all team members are educated and trained to perform the aspects of their jobs well. We continue to improve our knowledge and skills through continued education, certifications, seminars, and schooling. We stay on top of new trends and technology to provide the most efficient and quality service possible. Our clients can be sure that we have the ability to keep their properties looking their best. Our clients receive individualized plans because we listen to them and understand that their landscape and budget is unique. We continue to listen through the service season to ensure every person’s needs are fulfilled. 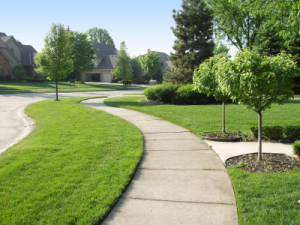 We pay attention to detail so customer lawns and properties are well-manicured. We anticipate problems such as weeds, mineral deficiencies, pest issues, and sprinkler malfunctions and promptly remedy issues. Often, clients are relieved from having to point out a problem because we initiate communication about it and present solutions before they have a chance to. At New Leaf we pay attention. If you’re looking for a company that will take away any worry you have regarding your lawn and landscape then New Leaf was created just for you. Whether you have commercial properties, an HOA, apartments, or own a home we have the values and abilities to meet your individual needs.